Lisa Lombardo January 29, 2019 January 28, 2019 No Comments on Self Reliance Roundup! And now that we are in the final stretch of the challenge, we have a couple of announcements to share! Our Self Reliance Giveaway was a blast! It officially ended on Saturday and the automated system picked a name…We have a winner! Cindy has a bunch of new books, seeds, fertilizers, bamboo plant labels, hand drawn seed saving packets, ebooks, organic gardening ebook and course, and even a dozen delicious oatmeal chocolate chip cookies on the way! I hope you will leave a comment to congratulate her! For a complete description of the giveaway, you can read about it on my post Self Reliance Bloggers’ MEGA Giveaway! I just want to take a moment to thank all of the folks who donated prizes to the giveaway…I hope you will stop by to say hi and thank them for their generosity! 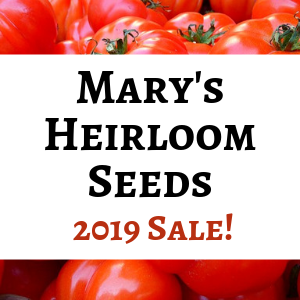 Mary’s Heirloom Seeds, Experimental Homesteader, A Life in The Wild, The Farm Wife, Nancy On The Home Front, Organic 4 Greenlivings, Stone Family Farmstead, Hidden Springs Homestead, Healing Harvest Homestead, and Home & Harrow. Thank you all for sponsoring the giveaway! Has it really been almost 31 days? And Now For Our Roundup! Our second announcement? Let’s have a party to celebrate all the great info shared this month! Yay! You can find links to all of the blogs on my page for The Self Reliance Challenge. Please stop by and check out the rest of their posts! Here is the cream of the crop! Self Reliance Bloggers’ MEGA Giveaway!